"One of the most effective tools we use to hiring our summer staff"
We interview over 200+ applicants for our 120 positions each summer. SparkHire gives us a way to capture an applicants personality and confidence by watching their video responds to our questions. This saves us time and effort and we try to get the best candidates on the planet! If you want the best candidates, SparkHire helps you sort through your applicants and evaluate them before you have a Face to Face interview. "Excellent for efficient, scalable interviews"
The best part of this platform is the increased speed in the hiring process. I no longer need to find time to A. call/email a candidate and have iterations on availability to find time for a phone screen or first round interview, B. figure out a time/place where everyone on the hiring team can get together to review candidates/interview them....and it improves the candidate experience, because they feel as though they've already begun the interview process. I've requested from their team that I be able to add/delete jobs en masse (this will be important for Sparkhire as they scale to larger employers), and to load candidate interviews faster - right now it's a tedious process to scroll/load 10-ish interviews at a time. This is problematic if you have several jobs with 30-50+ candidates. We are a higher-ed application for Sparkhire, and will annually have 700-1000 students apply for ~400 positions across 35-50 teams, and each team has their own dedicated faculty and sponsor. Sending the "universal link" for each teams' applicant videos is an extraordinary way for us to offer "interviews" without the impossible task of scheduling them, or pulling students out of class. What Video Interviewing solution do you use? "A Game-Changer for Small Business Recruiting"
I like the fact that we can increase our pool of potential candidates by having an easy, efficient online interview stage. What's not to like? I mean, I'm sure there have been times when I struggled to find something or it didn't work quite right, but they aren't what has stuck in my head. I haven't tried any alternative, but I have no need to. Spark Hire works a treat. We really wanted to cut down the time wasted on candidates who we called to interview based on application but were clearly not the right fit from the minute they stepped in the door. In a small business, you can't afford to take an hour out of your day to interview people you know you're not going to take on. And it's a waste of the candidate's time too. With Spark Hire, we get a much better impression of our candidates before we've put a lot of effort in. Spark Hire has improved our recruitment process no end. We have found that, since we started using it, we have been able to consider far more candidates and we've been able to filter them down to a few that really match the requirement. "21st Century Student Advising "
Spark Hire's video interview process has greatly improved a once arduous and time-consuming Student Advising interview process at our University. Moreover, I feel that the interview process is preparing our undergraduates for 21st Century skills that will undoubtedly benefit their job seeking experiences. The only quirk I have yet to figure out is the filter tags. When I set them to only view completed interviews for a specific job, the tag brings no results. Therefore, I type manually into the filter's search box and the results appear. Our interview process has been refined where one individual may easily receive notifications of completed work (email feature) and, with the same ease, disseminate the links to the interviews so that collaboration may begin (shared link feature). We benefit from more time gained and ability to multitask while reviewing. We're pumped to hear that Spark Hire has helped improve your interview process! As far as your quirk is concerned, we're more than happy to help you out. We will reach out via the email we have on file to set up a quick call with you. "Win-Win for employers & candidates"
The entire platform! Spark Hire connects organizations and candidates in a way that ensures it's a win-win and perfect match for both. The platform is user-friendly for employers and candidates, and flexible to meet our needs. We can easily set up jobs and customize interview questions to meet the job requirements, which has been an essential tool in vetting which candidates have the appropriate experience. We spend less time finding the most qualified candidates and we get the same feedback from our candidates. Once hired, we receive genuine feedback about how easy the platform is to use, that they felt excited to try the new technology, and that it demonstrated our commitment as an organization to using technology in new and meaningful ways. Every part of this platform is built to connect employers and candidates in a meaningful way, so we have no complaints! This platform provides the ease of setting up jobs and job specific interview questions. It also makes it easy to review candidates as a team and provide an independent review. We also receive feedback from those we hire about their experience and they all say that use of Spark Hire was a contributing factor to joining our agency - they truly enjoyed the process! As a small business, this platform has helped to streamline our hiring process, allowing us to compete for quality candidates through a shorter hiring process. The use of innovative technology also communicates a key aspect of our culture that resonates with the type of professionals we hire at our agency - those who are savvy about new media technologies and embrace using new tools in ways that enhance the communication process. "Huge time saver and very easy to use!" We really are very happy with Spark Hire and the ease of use for everyone. It has really freed up a lot of time for our team during the interview process and also has helped us quickly sort through applicants that are really interested in the positions we are hiring for and not just looking to get their application quota in for the week. We were not sure about switching video interviews but now love it and wish we would have started using Spark Hire earlier. Our only dislike, that is no fault of Spark Hire, is that some applicants are intimidated by a video interview. We just have to be very thorough in our communication that it really is a win-win for them and us. They get to show us their great personalities and do it on their own time! We get to see their interview on our own time and schedule. Win-Win! If you are considering a video interview platform, definitely consider Spark Hire. I have had great communication with them and they have always been helpful and even have asked me for feedback and what can be improved. Spark Hire has given us back time in our busy days. We are no longer wasting our time on phone interviews when it is obvious that it would not be a good fit on either side. The dashboard is very easy to navigate, it's very easy to share the interviews with other team members and we can go back and re-watch an interview if we missed something the first time. We could not be happier with this great tool. "Spark Hire's easy to use platform and excellent customer service." No implementation! Within a week or so of learning about Spark Hire, we were using the platform. The system is intuitive and easy to use and the customer service representatives are available any time for our questions. You have the same customer service rep throughout, so they get to know your institution and needs. When you begin using the platform, you get steps for success emails with easy to use instructions on getting started and best practices. The Spark Hire platform allows our hiring managers to have access to candidates across the country without the awkwardness of phone interviews or travel expenses. Our managers have been able to gain insight to an unlimited number of candidates while saving time and resources. We’ve had great response and feedback from managers and candidates alike. We have not run into anything we dislike while using Spark Hire. Save money on recruitment expenses, saves time and resources when interviewing, allows for record keeping of video interviews. Spark Hire has changed our interview dynamic. With the addition of the one way interview, we are able to process candidates more efficiently and test their skills, too. This allows us to set our questions and get answered what we really need in order to determine a hire. We like the functionality of using our own questions but appreciate the ones offered by Spark Hire. Also, the support has been helpful and questions are readily answered. Concerns are resolved quickly which is also important. It's an easily adaptable platform and is very user friendly. We have no issues with Spark Hire at this time. However, one recommendation I would have is to keep working on implementing it's functionality with ATS systems more easily. It would be great if the interview could auto populate into the ATS system without having to go into Spark Hire for viewing or without having to receive an alert. Auto integration would complete the cycle. I would highly recommend Spark Hire; it's been a valuable tool. We had run into a lengthier time frame with our interview process. Spark Hire has helped us to efficiently solve this issue without giving up the quality we need with the candidates. The interface is clean, easy to use, and works well for both interviewers and applicants. We've gotten great feedback from our applicants on the process as well as the support when they have an issue or a question. We love that SparkHire owns the customer support side, and proactively helps applicants, lifting that load off us. The limitation of 10 questions can be tough - if you want to get feedback on applicants from multiple data points with quick responses, this setting is limiting. Setup is fast and relatively easy - video questions do make it more powerful and a better applicant experience. Can easily save 20% on labor costs. It allows us to quickly assess critical skills of applicants and prioritize interviewing those who are the best fit, and for whom we are the best fit for. It's reduced our interview no-show rate by over 85%. SparkHire is incredibly easy to use. I'm able to post a new position and create an interview link within a few minutes. We've received great feedback from candidates using it as well. I have not come across any issues or deficiencies in the platform so far. Could not recommend this product more. Screening resumes, especially for an entry level sales position, can be very misleading. Making initial phone call interviewers can be extremely time consuming. SparkHire allows us to blend those two initial screens, allowing us to identify talent more effectively and drastically reduce time spent on the initial stages of our hiring process. SparkHire has improved the efficiency of our hiring process by at least 80%. Instead of the time-consuming process of making initial interview calls, we simply send out the video interview link and allow candidates to complete the initial video interview. We are then able to view the videos on our own time to decide who moves on to the next stages of our hiring process. With 24 departments to support and schedule interviews for it's a little difficult getting all interested parties together. With Spark Hire I can set up interviews that the hiring panels can watch whenever they have time to spare. No booking conference rooms, juggling schedules, worrying about no-shows, etc. Having this program allows us to get to through the initial interview process much quicker! So far I have not experienced anything to dislike. I have had a few candidates contact me stating there is a $4.99 fee for the application. There is NOT a fee to download the application. To solve this I have added that information in my invitation to interview notification. We are able to complete the initial interview much quicker since we don't have to get everyone in the same room at the same time. "Great Functional Video Interviewing Software"
Sparkhire is a good platform for video interviewing. Whether you're using it for one position or multiple positions, it can handle the job. It's user interfaces are intuitive and the functionality allows us to do many things. In fact we don't even take advantage of all the software is able to do. The one-way interview feature is by fare what we use the most often. It allows us to interview more people to begin with. The set up of the interviews is easy and the feature that lets you record video intros to any question you send is very nice as well. The pricing for this software is different. You pay based on the number of jobs you want to use it for at the same time. Since our hiring goes in cycles, many times we only need it for one job, but sometimes we need it for up to 5 jobs. We end up paying for 5 jobs all throughout the year since that is the max number we might need, but we only use it for 1 job much of the year. There are some little features that could be improved, and we'd love for Spark Hire to tie into our current application system (it does some but not ours), but overall we like the product. I would recommend this product if you have large candidate pools for positions. It can give an extra level of screening and open the door for candidates who may not screen well on paper. We are trying to accomplish a few different things with Spark Hire. First and foremost, we want to widen our candidate pool. The positions where we use Spark Hire usually have 100+ applicants. Typically we would bring in only 5 of those candidates to interview in-person, but by using Spark Hire's one-way interview feature, we can widen our net and video interview up to 20 candidates. Many times we end up hiring someone who would not have gotten an in-person interview had we only selected the top 5 candidates. "An efficient way to G2K your candidates. A real time-saver!" - There are several occasions that the relative deadline we set isn't the one the candidates receive on their invitation. We are using Sparkhire to facilitate the G2K our candidates stage of our hiring process. We have basically replaced the phone interview with a video interview. It allows us to assess at an early stage several skills and qualities that we consider important. We mostly use it for our massive hiring and entry-level positions. As I said before it saves us a lot of time (we don't need to schedule a live call during our working hours; we can watch the videos and give feedback at our own convenience and designated time). Even our candidates see a benefit to it as they don't to skip a day at their current employers or drive long-distances to meet us. They do it in the comfort of their living room, with the option to re-record. It possibly adds value to the candidate experience that we offer. My team has loved the flexibility this platform has given us. We don't need to worry about coordinating schedules to get an interview process started. The candidates can do this from the comfort of their homes and we can allow more potentially amazing candidates interview! The only thing I dislike is not being able to easily find my "how do I" answers. But, I just email my rep or customer service and I have a quick answer! If you are considering a video interview platform, Spark Hire is very easy to use, with amazing customer support and affordable! We are using this as part of the interview process. It has been such a time saver! It allows us to interview more candidates and have a stronger evaluation since we can also see how they present themselves, especially since we give presentations as part of our roles! The support we received was excellent and the one-way interviews were a GREAT way to narrow down our prospective candidate field. We will definitely be using Spark Hire again! We didn't like that two-way Live Interviews didn't work with the mobile app - the vast majority of our prospective candidates used mobile for the one-way interviews and we ended up having to do phone interviews for the two-way instead of using Live Interviews. WiFi on the candidates' side was also an issue and we had a lot of dropped video experiences when the Live Interviews were being conducted on the computer platform. We gained TONS of time by not conducting in-person interviews with every single promising applicant. We actually only interviewed one person in-person thanks to Spark Hire, so we probably saved close to 40 hours by interviewing everyone else with the one-way screen and by video conference or phone. We saved literally a full work week by using Spark Hire - that's pretty amazing! And that was for a small company with a limited number of applicants for one position - a bigger company, more jobs to hire for, or more applicants could mean an even bigger time savings. You can have a monthly contact instead of paying annually which made this the most cost effective option. It also integrates with our internal systems making it user friendly and keeps our processes smooth. Nothing. It worked really well for us. The only thing I would change is when we use our ATS integration, having the ability to send to a number of people in one go rather than individually. Make sure you are informing candidates they will receive a video interview and you will have a higher completion rate. We have been able to do large volume recruitment using Spark Hire taking less man power and been able to remove the barrier of a CV as we have used Spark Hire to recruit for entry level roles. For these position we do not need prior experience, but as they are sales roles we are looking for personality, drive and commitment which we have been able to assess successfully utilising video interview as our first stage of the interview process. Spark Hire is an intuitive platform to setup from the administrator side and for candidates to use. The system provides a substantial time savings for our high volume application roles and gives us an opportunity to create a great candidate experience by being able to follow up with candidates in a timely manner. I would like to be able to have Spark Hire read to my current applicant tracking system. Take a few minutes to think through your most important questions across the roles you hire for to create a bank of Spark Hire questions to easily use as you add jobs. Keep the time commitment to answer questions reasonable 20-25 minutes and get excited about having more time on your calendar than when you were scheduling individual screening calls. Being a small team, Spark Hire increases our capacity to screen candidates in a timely fashion, create a great candidate experience and reduces the time between hiring process steps. The time we spend on recruiting can be long and tedious. With Spark hire, our aim was to reduce the time spent on reading cvs, phone interviews and the arranging face to face interviews. With video interviews where we can get an initial insight into what the candidates are really like and how they can cope with the pressure of a video interview environment. This is reflective of the pressures that they may have to deal with within our organisation. "Great tool for video interviews!" I liked that the video responses had time limits. You can also navigate to specific answers without having to listen to one long video straight through. This makes it easy to review submissions when time is available, without having to dedicate large amounts of time to the process. There's lots of functionality. This was my first time using it and our HR team didn't use all of the platform's capabilities. That caused a little bit of confusion since we didn't do the entire candidate review process within the Spark Hire environment. Great, intuitive tool for including video interviews as part of the application process. Our business problem is schedule coordinating among multiple staff with busy schedules and various candidates' schedules. Spark Hire allowed us to see candidates without the hassle of coordinating staff and candidate schedules. "Changed the way we hire"
Love that we can screen multiple candidates with the one-way video interview. I love the ability to get through candidates in a quick and timely way. Using spark hire made our hiring process much easier in many ways. We could screen multiple candidates in less time and by being able to see how the candidate presented on video. we were able to taylor our interview questions more efficiently. We now use this tool for multiple positions. We are better able to scale our coaching organization and we have expanded using Spark for other areas of the company. It allows us to move faster. Spark Hire allows us to send a large quantity of applicants through the one way interview process super easily. This saves myself tens of hours from scheduling, coordinating, and phone interviewing during the first rounds of the interview process. No joke, tens of hours each and every time we look for a new candidate. I think Spark Hire could do a better job with its sorting of candidates during the review process. If you utilize custom tags and filter it works.... but it could definitely be done much cleaner. If you are tired of scheduling and handling a bunch of video/phone pre-screen interviews try Spark Hire. I use Spark Hire to confirm if the candidates are presentable, able to talk in a professional manor, and can clearly answer the questions asked. This allows us to narrow down the list of hundreds of candidates to a manageable amount in a short period of time. "User friendly and great customer service!" So easy to use - no training needed! The menus, options, and ability to hover over an icon and see what it means are all very useful. It's intuitive and makes sense - the tips and practice questions they provide are very helpful to the candidates. I like that you can save interview templates, and the options for how many takes, and length of think and answer time is nice to have control over. The service from the sales side and the technical side has all been excellent! Thank you Spark Hire for being a great partner in our process! Nothing - my own sorting system of tagging and saving videos needs improvement - but that's user error! Don't look any further - give them a try! We have sped up the interview process with the help of Spark Hire, and have been able to review more candidates in a shorter period of time. Candidates have the convenience of completing the interview when it works best for them. No more back and forth trying to schedule an interview during working hours! The customer service at Spark Hire has been great since day 1 - they are easy to work with and their technical support has been very helpful for our candidates and respond in a timely manner. "SparkHire is vital to quality over quantity"
I really like that I get a higher quality candidate. We also are now getting way less no-shows at interviews and way more hires from interviews. There is just a lot less wasted time all around! What I dislike is that some people just wont do it - or say they have problems and want a phone call. Which is fine whatever yeah but I don't think that they do as the email says and contact SparkHire for help. I get that they are eager for the job - and not all hourly jobs do one-way video interviews - but phone calls do not typically work as well as the videos for us as a company. I think a cool feature would be sort of like google phone. Since some people do not want to do videos I call them - however I am about to go overseas and not be able to do that soon. So we had an idea where people could answer the questions by calling in to us and just leaving them as a voicemail. I tried that and it did not work - the voicemail cut me off bc it was too short a limit on time. So many just some option for if someone cannot or will not do the video - an easy way to get them to answer the question for someone who cannot give them a phone call. We use the videos in lieu of phone screening potential employees. I am just one girl who does the recruitment for a national company (seven cities and growing) and the phone screens were taking so much time and literally just throwing it in the bin! With SparkHire I ask the same three questions I would have on the phone - and instead of calling people for days I just get the videos when it suits them - and that is amazing for me and the potential hire. "Spark Hire Improves our Efficiency"
Support!!! The team to support me AND the technical support for candidates is excellent. Honestly, there is nothing about Spark Hire that I dislike. Set up was a snap; my representative (Ryan Rodino) is amazing - he's always just a phone call or email away. His goal is to help us be as successful as possible with Spark Hire. We can interview SO many more candidates when utilizing Spark Hire interviews so our "time to fill" statistic is decreasing! This also gives us the ability to have the client preview the interview as well so they're going on more than just our feedback before an on-site invite goes out! We loved being able to respond right away to our candidates with an action step they could take to continue the application process. Also, it was very helpful to get to briefly know the candidates and decline the ones that were obviously not a fit, and then be able to dive deeper in with the candidates that we did like during our first live interview. Lastly, our team is located in 2 different countries so this helped us all to get to know the candidates even being in different locations. This resource absolutely saved us time and helped us know our candidates better. As I typed comments while I watched the interviews, it would have been great if it would have saved my comments automatically. I lost all my notes a few times when I forgot to save or closed the window before saving. "Hiring in the 21st century!" Spark Hire made it incredibly easy to incorporate a fresh hiring process with the use of technology. Their process breaks down the barriers from both the candidate and employer side which were created by traditional recruiting methods. Can be intimidating for some candidates that have not experienced a video interview process. Try it out and use the support team, they're awesome! An efficient way to track and evaluate job candidates through multiple qualifying stages. One dashboard with multiple (permission based) users that can contribute instead of repeat. "Spark hire saves the day "
The program itself is simple and effective. The best part of my experience has been the customer service. I can always talk to someone who can help me with any questions I have. Due to this exemplary customer service, I have had all of my complications taken care of immediately. The only downside would be that occasionally potential applicants are put off by doing an interview on the computer since they never have before and may have issues with using technology. Saving time and finding the right staff. Being able to understand how a person interacts is much more beneficial than simply reading a resume and cover letter that could have been completed by anyone. "Spark Hire Allows My Business To Thrive. Spark Hire Is Where Technology Breeds Efficiency "
This is my second year using Spark Hire. I have been waiting for a service like theirs for years; and in 2016 I finally found it. I am on my third year with Spark Hire and will not be turning back. Without compromising the product, they are professional, customer friendly, and extremely inexpensive compared to competitors in this space. There is very little I dislike about SparkHire. However, I do wish there was a feature to control the duration of the live interviews on my calendar. Currently it defaults to a one hour time slot, while many of our interviews are less than 30 minutes. However, I believe they are currently working on that feature. Plan how you will use the product before starting to build out the backend. I have increased productivity with this technology. I am able to interview three times the amount of people with the one-way interview platform, before spending my staff's valuable time on live interviews. This is invaluable and my staff loves it. Even the applicants have commended us for our simple and easy-to-use system (which of course is our use of the Spark Hire platform). "Best Tool ever in 2017"
It's super easy to use! It is worth the money, it's easy to use, has several applications and hiring managers love being able to basically conduct their interview in our office by giving us the questions to ask and they can watch the video interview at their leisure. Some people don't pay attention to what is going on in the background of their video interview and what personal belongings need to be removed from view. It's a great tool, give it a try! Getting candidates in front of customers quickly. Generating revenue starts when candidates are hired. We needed to find a way to get our candidates hired as quickly as possible. I like the simplicity in the connection, when I start to ask questions to the employees we can realize that the software fullfill the requeriments when I hire a person. It let me know that the platform is well desingned to those who want to hire peope. First at all, I do not like the price they show when you are going to sing up, I think it too expensive for the service they announce, of course, it is devided into the number of months but it has still a hight cost. I will recommend this software because s more comple than other ones, the tools are easy to use and te connections are grate, only for qualified recruiment group. I have used it a couple of time but the most important thing I have solved is the quality of people that I hire, the softwar allows me to meet the requeriments and the profile of the people I am looking for. The benefits have been many, but the main one is that it has brought me the amount of quelified employees that I have today. "The best hiring page software"
I like that software because I see we can interact with people while we are interviewing them, the easy tools that this program has in without any doubt one of the unique platform that employers and bosses have to use. I don´t like to much the price or cost they offer us , in fact, they show three payment options in which goes from the minor cost pack to hugest cost pack,. They warranty with these methods a only annual payment; in addition to this, the payments are divided in twelve months for a total cost of it. I recommend this software because it give us the opportunity to improve a new method of hiring personnel and to use better the selected questions to get better results when we hire. Spak Hire has gave me a lastly connection to the hour to interview people and contact providers through Internet. The major benefit I have received is that with this platform is simple to use because I am able to get more qualify candidates to my business in a fast time by creating selected questions. "Spark Hire for Recruiting in Agency Setting"
In a nutshell, it's just really easy to use! Easy to share links, easy to review. Candidates seem to be able to log in easily and rarely have technical challenges. I realize this is likely user error, but I've found that candidates don't seem to allow enough lag time at the beginning or end of the interview video. This tool allows us to put our candidates' personalities in front of decision-makers, rather than just a resume/application. This can make a big difference for "out of the box" candidates. SparkHire is a game changer! Extremely well designed, flexible and intuitive. Everything is well designed, reliable and pleasant to use. One-way video screening interviews have accelerated our hiring speed and improved our quality of hire. Cool calendaring function (syncs with Exchange / Outlook) for candidates to select a time slot for two-way interviews etc. It is an outstanding system! And customer service is nothing short of exemplary. A pleasure to work with the SparkHire team. Inability to select two or more retakes AND select limited think time. For instance, you can't select a limit of two re-takes and select 1 minute think time. Huge volume of job applicants to sort through. SparkHire helps us virtually eliminate phone screening calls and increases our quality of hire. "Sparkhire is a Game Changer for our HR dept!" The best aspects of this service are the capacity to Screen/pre-screen applicants on my schedule rather than traditional work hours. It's also so simple to use that the time investment on the front end makes it super easy to implement and maintain. Allows for a flexible pre-screening of applicants that is easily shared with our team. Is the first benchmark in assessing applicant capacity...can they operate/figure out the process and will they engage. By allowing them to re-record their responses, we can assess the mindset of those that make sure to take this step seriously and present the best response, and those that "wing it"...but not well. "Great platform to quickly evaluate candidates"
Flexibility of the questions and timing of questions, and ability to share w/ colleagues. Difficult to share multiple advanced interview links w/ multiple colleagues. I'd recommend taking advantage of the good customer support early. If you are new to using the platform, it'll be good to understand exactly what you are sending individuals you hope to recruit. Ability for many team members to evaluate new hires on their own schedule. "Spark Hire saves us valuable time during the hiring process"
I love that I can review 15 candidates in 30 minutes and get a feel for who they are and whether or not they would be a good fit for our culture and if they can communicate well. I would like if it was easier to rate a candidate as a whole not just per video, I know there is an option just make it easier on the initial profile page . It is a must have to save your self a ton of time interviewing people that would not be a culture fit and it is so affordable, literally it's costing you money and time not to have this step in your hiring process. What is great about using Spark Hire is that it is so seamless and easy to use. You can jump in and review 15 candidates in less than 30 minutes and get a feel for how these people communicate. One of the biggest things when hiring people is getting below the surface and understanding the 80% of who they are. Its called the iceberg affect. When you interview in person you are only usually getting the best version of that person, the 20% as you would say. Well, when you add Spark Hire to your hiring system it forces your candidates to be genuine and real because most people are uncomfortable on camera which in turn allows you to see the authenticity of that person to make sure that they would be a culture fit for your business and worth taking to the next step of your interviewing process. Additionally the software is so simple to use and to rate your candidates and leave notes so that you can have multiple people in the account and know what is going on with that candidate even if they were not involved in the interview process. Spark Hire has been a huge value add for our business and it is very affordable. "Cut our recruiting time in half "
We were able to eliminate our phone screening and face to face interview with the Spark Hire Platform. There is nothing that I have an issue with. Definitely give it a try! Product and customer Service was great! We were able to cut our interview process time in half. We were wasting lots of time scheduling interviews and and traveling to interviews. I love the usability of the platform. Nothing feels convoluted or confusing. A lot of pointing, clicking, recording, and waiting on your invitees to complete their interviews. I honestly cannot think of anything that I dislike about the service, but then again, after watching a demo and consulting with a rep, I feel like my expectations were realistic. If you want to save time interviewing and create a saved interview format that all the hiring managers can view at their earliest convenience, then Spark Hire makes the most sense. This is a massive time saver, because we all know that a candidate might present in a certain way over the phone. The overwhelming majority of the population however cannot fake the way they present in a video interview, no matter the format. "Excellent Product and Service from Sparkhire"
The interface is great. Candidate feedback has been good but the best part has been the customer service and attention to detail from the the team. Nothing - it's a good product. The only issues we had were with the requirement for users to register but that was actually a useful screening tool as it did not take long and showed an increased desire to interview for the role. We are saving huge amounts of time on candidate screening and since using Sparkhire we have not had one bad face to face interview. I love that we can customize and pre-screen potential candidates before investing too much time into the process. You can very quickly see who is invested in the position and who is just looking casually. Nothing that I've come to dislike so far! We hire many work at home employees and in office employees, we solve initial interview problems by scheduling pre-screen interviews and video interviews. This eliminates a lot of wasted time in the recruitment process trying to get people on the phone for pre-screened interviews. Spark Hire saved my management team time and money while hiring 115 employees for our new location. I wish we could have put a video clip together from everyone's video interview to show at orientation. Managers do not have to be working a certain day of the week to sit down and conduct an interview. Biggest benefit was a year later looking back and seeing the first people to reply to the video interviews are the most engaged employees we have today. "Spark Hire - Awesome tool to differentiate candidates "
I don't like that it is hard to rerecord one specific question of a list of more than 1. Benefits: Ability to differentiate candidates, way to show personality, good for an additional candidate screening tool. Problem: People are not interested in recording the video, or clients aren't watching the video interviews. "Spark Hie was very useful"
It was great to see the candidates answer their question once on video and able to share with the hiring team. The interview portion of live had noise and echo> Not sure if it was on our end. Saving time. It also helps when a hiring manager is out of State. "Awesome way to let your candidates speak to you!" I dislike that candidates can sometimes feel like it is a negative process. I view it as a way that allows them to shine. Best price and use available. We have solved the problem of needing to schedule our busy leaders for in-person interviews without having a good feeling that they will like the candidates from watching their video. 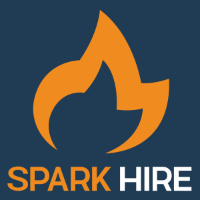 Spark Hire has been an excellent resource for our business over the years. The platform (and app!) is super easy to use and service is great. Vince has been incredibly helpful over the years and we look forward to continuing to utilize them as we grow. Honestly wouldn't change a thing. The platform and service are great. Huge time saver! Really great to be able to sift through hundreds of candidates and narrow down to the handful that are perfect for the role. Interview days are much more enjoyable! We have hundreds of applicants apply for a single position and being able to get insight on their personality is incredibly valuable. The Spark Hire platform is easy to use. We started using Spark Hire to cut down on the amount of time it takes our team to screen candidates. We do high volume hiring, and we have a small team. This has really helped us become more efficient and effective. "Convenience and collaboration in the hiring process streamlined." As a virtual team, I love the ability to review candidates with my team in our own time, while still collaborating to find the best hire. For live team interviews, we use an external option to accommodate both a higher number of team members participating and option to record if needed. We're an entirely virtual team, so face-to-face interviews aren't an option. Using video interviews we're able to more efficiently go through our hiring process using one-way interviews and only moving select candidates onto live and/or phone interviews. "Excellent technology for today's recruiting"
Nothing at the moment, other than requiring 40 or more characters for this field. Highly recommend, we have had a very positive outcome using this product thus far. This is definitly a time saving product. Eliminates needles steps in our process. It is so user friendly! The process and tools are laid out very clearly and it is easy to walk through each step. It makes it easy to train other staff members regarding Spark Hire interviews. It is quick and easy to logon and review completed interviews. I don’t really have anything that I dislike. I like being able to schedule multiple interviews over a short period of time. I interview job candidates all over the United States. SparkHire is an easy to use platform that makes the process more efficient and effective. It allows me to review applicants on my time and share interviews with other team members before investing on travel for an in person meeting. The mobile version is not as easy to use. I can screen more job candidates. * We monitor all Spark Hire reviews to prevent fraudulent reviews and keep review quality high. We do not post reviews by company employees or direct competitors. Validated reviews require the user to submit a screenshot of the product containing their user ID, in order to verify a user is an actual user of the product. Hi there! Are you looking to implement a solution like Spark Hire?